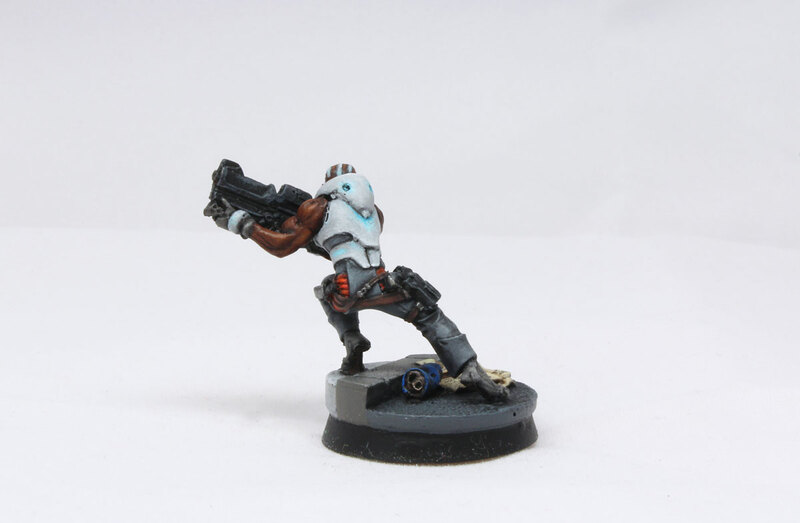 My latest model is Moderator form Infinity The Game – Nomads Bakunin Jurisdictional Command. Generally in next few weeks I have a plan to concentrate my painting efforts mostly on Infinity (with some breaks for Malifaux). I recently have bought Infinity Rulebook and after quick study I must say the game system is pretty wicked. First of all, forget about D6. It’s like back to the past and to my AD&D days – in Infinity Game you use D20. This is uncommon, right? Everything is quite similar like in most of the games – testing stats with dice rolls, but Infinity despite everything using for this purpose D20. And I don’t even owe any 20-sided dice anymore! Wicked! 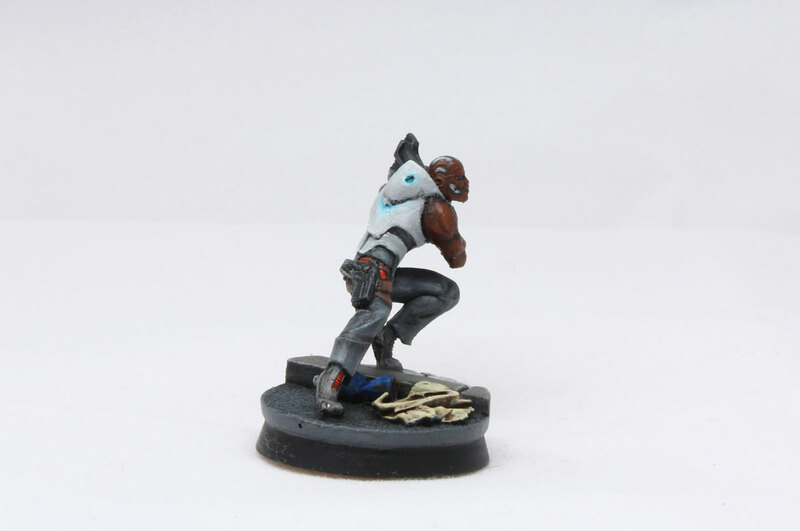 I’ll have opportunity to test Infinity rules (and my slowly growing Nomads Bakunin Force) in action in about two weeks (as soon as I finish painting models), and I’ll see how everything looks on the tabletop. But first… I need to paint core of my Bakunin army… and there’s lot of work ahead of me. About two weeks ago I finished my first model to Infinity – Reverend Custodier. Wow, it was quite demanding miniature. It took me around 5-6 hours to finish it… Lots of details to paint and everything is tiny – quite a task after all GW miniatures with their big eyes and bulky silhouettes. Comparing to Infinity Games Workshop miniatures are kindergarden level. But it’s fun too! These Infinity models require from me increased level of concentration. It’s so amazing! I never imagined I could focus that hard on one model and spend so many hours just to get better effect. Well, apparently I can do that:). Anyway – my next model is Moderator of Bakunin. Moderators are police force of Bakunin. Universal soldiers designated for all kind of military operations. Fairy skilled and reliable. In the game – mediocre unit, but providing such precious orders for your army. The model I painted has very dynamic posture. Because of that I had some minor problems with sticking it to the base. Originally he has his left foot on the rock, and there should go the pin. I had nice resin base with part of the street and the curb. And it seems like a perfect idea to file it off and put the model left foot on the sidewalk, and right on the street. After I’ve done that, I realized it will be impossible to pin it to the base – there was not enough space left to insert the pin ( its feet were to thin for the pin…). My last hope was to glue it down with some really, really strong glue. So I did – and it looks fine…It is glued for good- and I don’t think It will be easy to get off the mini from the base. 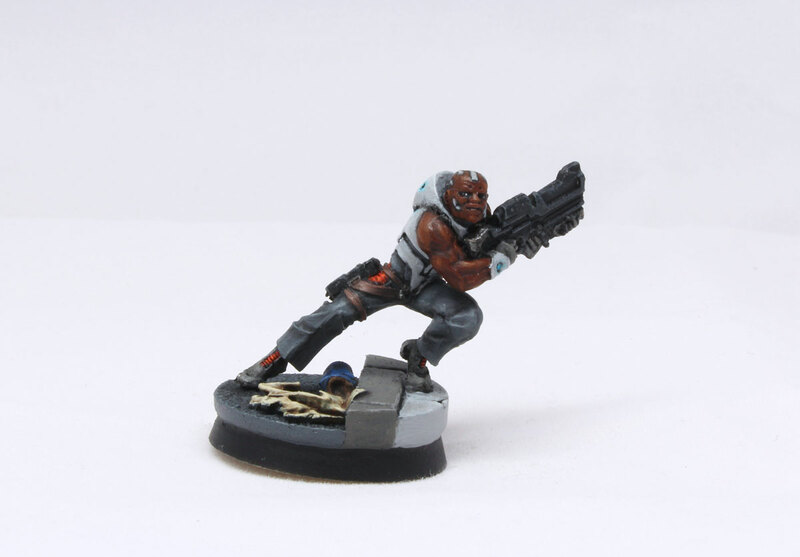 Colours: Black skin – Mournfang Brown with shade of Nuln Oil. Jacket – Administratum Grey with some gentle Temple Guard Blue lightening. Pants – Mechanicus Standard grey – plus some red/orange parts: Wild Rider Red and Troll Slayer Orange. I can admit – the amount of work put into this Moderator was definitely less than for Reverend Custodier. The model was demanding, but right now I knew what to expect. I can imagine very next model for Infinity will go more smoothly. Wishful thinking, I know:). 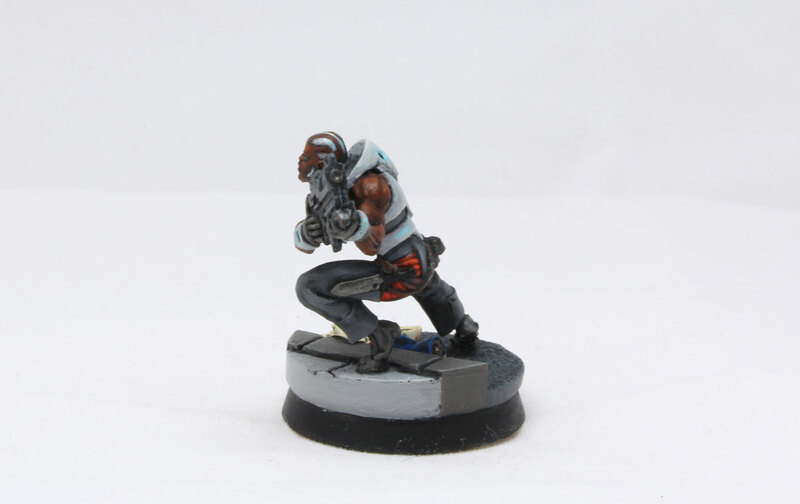 Plans for the future: simple – expand my Infinity and Malifaux projects. There are so few miniatures needed to be painted to start to play, so I expect 2-3 weeks to go. I pinned my first few Infinity minis using fairly traditional methods, and then somebody suggested that I turn the slotta/rocks/etc into pins, which works brilliantly. Just cut and file whatever lump of metal comes attached to their feet into pins. You get thicker pins that are actually an extension of their feet instead of a separate piece. https://ratseast.wordpress.com/2014/03/10/my-ariadna-force-nears-completion/ for the first time I did it (at the time it apparently struck me as a good second choice, now I do them all like that if I can).